The orthopedic braces & support, casting & splints market is extremely fragmented owing to the prevalence of numerous players in different strata of the market, states Transparency Market Research (TMR) in a research report. The market is highly competitive with a large number of global and small local players functioning. In order to establish a firm hold in the global orthopedic braces and support, casting and splints market, distributors across the globe are joining forces with several small manufacturers and are focusing on offering off label merchandises with high margin. The top-drawer companies operating in the market are 3M, Össur Corporate, BSN medical GmbH, DeRoyal Industries, Inc., DJO Global, Orfit Industries n.v., Spencer Italia S.r.l., Prime Medical Inc., Styler Corporation, and Zimmer Biomet Holdings Inc. All the companies operating in the market are focusing on growth through acquisitions and are also concentrating on product portfolio expansion. The global market for orthopedic braces and support, casting and splints is projected to rise at a 6.4% CAGR between 2016 and 2024. In 2015, the market was worth US$4.6 bn and is poised to reach a valuation of US$7.9 bn by the end of 2024. According to a TMR analyst, “The orthopedic braces & support is expected to account for the leading share of 58.4% in 2024.” Sizeable number of people wear braces and many more still need to make their daily life comfortable and adjust deformed teeth formation. Nevertheless, companies are continuously working on material and technology to provide braces as per requirement of the patient. This in turn is expected to fuel the progress of the orthopedic braces and support segment in the next couple of years. Amputation of a limb can be triggered by various reasons such as hereditary limb deficiency, vascular disease, cancer, or accident. Changes in lifestyle are making an individual more prone to these calamities. This is expected to drive the orthopedic braces and support segment between 2016 and 2024. 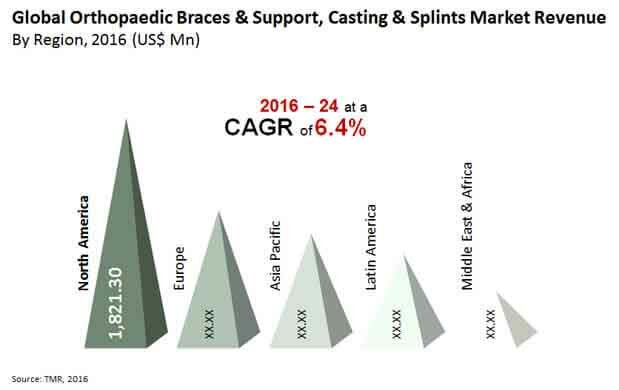 Region-wise, North America led the global orthopedic braces and support, casting and splints market in the past and is likely to continue this trend with a share of 38.2% in 2024. It is expected to be closely trailed by Europe and Asia Pacific in the exact order. Factors such as rising demand for orthopedic knee support braces in the U.S., increasing sports injuries, and companies focusing on complete service delivery for enhanced popularity. Incessant growth in the global geriatric population is one of the primary reasons behind the rising consumption of orthopedic braces and support and casting and splints. Bone disorders such as arthritis, back pain, and osteoporosis are common problems globally. With advancement of age, cartilage is prone to strain and fatigued due to less water content. This leads to arthritis and cushioning at the joints which requires casts, splints, or braces. Additionally, other connective tissues such as ligaments attached to the bones, become less flexible and more constrained, which is expected to drive demand for casts, splints, and braces among the geriatric population. Sports injuries are expected to drive the foot & ankle devices market during the forecast period. According to a study by the American Academy of Orthopedic Surgeons (AAOS), about 25% of sports injuries were associated with lower limits such as foot and ankle. Severe bone wounds have been reported recently among experts as well as unprofessional sportsmen. However, unfavorable reimbursement policies and high-costs associated with the materials used are likely to restrain the growth of the market in the coming years.